My family of five and I are an average family. We make messes, break a glass here, loose a fork there, forget about homework until the morning its due, you know the normal things. I have no magic up my sleeves, though I check daily to see if I’ve missed it. I have two boys under six, a husband in the military and my grandmother all under the same roof causing all sorts of chaos and havoc! This was all just fine until we added moving across the country into the mix. Upon the news to move we decided to put our house up for sale. Now, I know how to handle two kids on my own for months. I can change the oil in my car, mow the lawn, build a garage, juggle soccer, work out, and a whole lot more while my husband is deployed. But moving my family to the opposite side of the country…aahh, I don’t even know where to start and he’s home right now! So I figure like anything else I might as well just jump in. My OCD allows me to keep my house clean on a daily basis, even if it’s a never ending battle, but now the OCD is in overdrive waiting for these showings to happen! Like I’m sure many of you are aware cleaning up after a two and five year old is no laughing matter. Then trying to keep the house spotless for the drop of a dime phone calls is a full time job in itself! When the two are combined we’re lucky if we can even remember our names by the end of the day! Here’s a few tips I’d like to share with you and remember I’m still going through this myself so bear with me! Those Swiffer wet pads and dusters really are a time/life saver! As you can see it’s mostly common sense things BUT when you’re trying to vacuum, chase a kid around attempting to get their socks on, sticking the dogs in the crate or car, finishing those dishes and quickly hiding all the miscellaneous things laying around, they tend to be forgotten! We all know moving is hard and we just can’t wait until we finally get it over with. Just remember that your house is as clean as its going to be because, well, you’re still living in it!! Chances are you’re going to be more stressed about the appearance of your house then the potential buyers are, they understand that you’re living there! Remember moms, your little ones are going through a lot too right now. Either they are simply too young to understand what is going on, or are just as nervous as you are about this new chapter in your life. Just breathe, laugh off the small things and make the most out of what little down time you have. Everything will fall, in one form or another, into place! 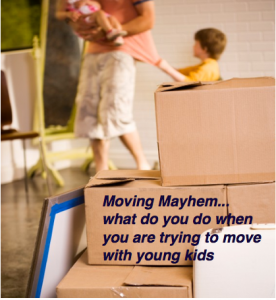 Even for a super mom moving is mayhem!